The baroness has returned! This fantastic, bullet-shaped peony has seen a surge in popularity in the past few years. It makes good sense though, because the pale pink colour of this peony in combination with the thick buds give Paeonia Baroness Schroeder an exceptional, timeless appeal. 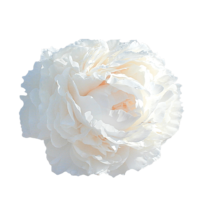 She was not for nothing selected as one of the peonies for Pippa Middleton's wedding. Baroness Schroeder is a full-petalled, bullet-shaped peony and is impressively sized, both before and after blooming. The buds can be about 45 mm and the flowers about 17 cm wide. The colour is initially a very pale pink, but soon shifts to a bright white. The transformation of Baroness Schroeder is an impressive spectacle that is accompanied by a fantastic fragrance. This ‘noble lady’ was bred and registered in 1889 by James Kelway. To this day, Paeonia Baroness Schroeder still is one of his most honoured peonies. Cut the stems diagonally and put them in a vase with some lukewarm water. Add a little sugar or flower and enjoy!